Devon— Major construction projects at the University of Alberta Botanic Garden are on track to be completed by the time the Garden opens for the season on June 29, 2018. The Garden has delayed its usual May 1 opening by almost two months, but visitors will be rewarded for their patience once they experience the Garden’s new features. When the Garden opens on June 29, visitors will be able to experience, for the first time, the much-anticipated Aga Khan Garden, Alberta (AKGA). Unlike any in the province, and the largest of only a handful in North America, the AKGA is a spectacular contemporary garden inspired by traditional Islamic design, with water features, intricate stonework and geometric patterning. This beautiful feature is the result of a $25 million gift from His Highness the Aga Khan. When visitors arrive at the U of A Botanic Garden, they will also be greeted by a brand new feature entry sign, parking lot, ticketing area and entry plaza, among the many improvements that have been under development for the last few years. The delayed season opening will have impact on some annual events that normally occur in May and June. While it has been possible to reschedule some activities for later in the season, others, like the popular Mother’s Day Tea and Kurimoto Japanese Garden Spring Festival are cancelled for 2018. The late season opening will not affect school field trips, weddings, and adult education classes, which will continue as scheduled during May and June. The Garden’s popular annual plant sale will be a two-day-only event, on May 12 & 13, and be held out of its production greenhouses. “We’re looking forward to the return of our full event line-up next year, and we’re grateful for the understanding and patience of the public, our volunteer groups and community partners,” said Foote. Because of the Garden’s early closure in fall of last year and late opening this year, anyone who purchased a Season Pass in 2017 will have their pass extended to Thanksgiving, 2018. After nearly a decade of planning and 18 months of construction, the Aga Khan Garden, Alberta will be open to the public starting June 29, 2018. Made possible by a $25-million gift to the University of Alberta from His Highness the Aga Khan, this spectacular garden is unlike anything on the continent – 4.8 hectares of modern architectural beauty inspired by Moghul traditions, designed for the Edmonton region’s climate and topography. This is a garden for all people, of all ages and backgrounds, to connect with each other and the beauty of nature. It is a living symbol of hope, peace and unity – a place where understanding takes root. Throughout the 2018 season, our gardeners will complete the planting of over 25,000 new perennials, trees, shrubs and wetland plants, along with finishing touches on landscaping. In 2019, once new plantings have had a chance to become established, we will announce a public grand opening celebration event. We welcome you to experience this one-of-a-kind new feature at the University of Alberta Botanic Garden. The Aga Khan Garden is like no other space in Alberta. It's "a place of peace, a place open to all people, a place that welcomes different cultures and a place that gives a ... nod to the placement of humans in nature," says Lee Foote, director of University of Alberta Botanic Garden. Foote calls the garden his "baby" and can't help but beam as he tours media through the new attraction. "This is a garden like you get once in a lifetime. I'm tremendously proud of the garden and the people that run it," said Foote. The 4.8-hectare Mughal-inspired landscape containing 25,000 plants, trees and shrubs, required close to a decade to plan and 18 months to build. None of it was possible without a $25-million donation from the Aga Khan, spiritual leader of Ismaili Muslims, Foote said. 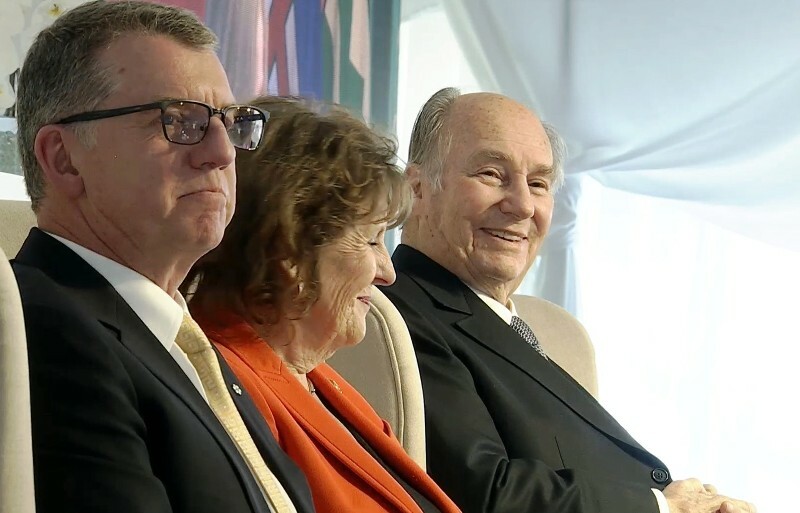 "To us he's a grand donor and a kind gentleman," said Foote, who is hoping the Aga Khan will return to Alberta for a celebration of the space in 2019. The garden, southwest of Edmonton on Highway 60, officially opens to visitors Friday. The spectacular new Aga Khan Garden, Alberta, is a gift to all Albertans from His Highness the Aga Khan, the spiritual leader of the Ismaili Muslim community. The Aga Khan Garden, Alberta, will draw people from all backgrounds together in the largest Islamic-inspired garden in North America — an environment where cultural acceptance and understanding take root. Part of the University of Alberta Botanic Garden, located 5 km north of Devon, Alberta, Canada, the Aga Khan Garden, Alberta, opens to the public in June 2018. For more information, go to https://www.uab.ca/akg . In this series of videos, learn more from the landscape architect about the details of the garden. The traditions of the Islamic landscape are remarkably diverse but have common elements. The Aga Khan Garden, Alberta incorporates some of those basic common elements, adapted for the four seasons. The result is a truly unique, beautiful and meaningful space. Geometry is an important element common in Islamic landscapes. The geometric structure of this garden acts as a framework for the local wetlands and honours the ridges of sand dunes that were once an ancient glacial lake. The landscape architect discusses how local plants featured in the garden respond to the seasonal changes and the paths are highlighted against the woods. A natural opening in the woods provides an opportunity for a special learning and entertainment space in the Aga Khan Garden. This additional gathering space will contribute to an expected increase in attendance—from 75,000 to 160,000 visitors each year—when the Aga Khan Garden, Alberta opens 2018. The landscape architect discusses how this garden will significantly add to the curated collections, educational programming, research and conservation efforts of the University of Alberta Botanic Garden. WATCH ABOVE: The Aga Khan Garden is set to open Friday at the University of Alberta Botanic Garden in Devon. Take a sneak peek at the facility ahead of opening day. 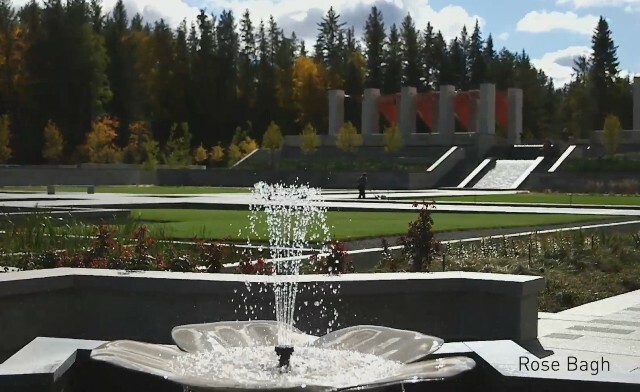 After nearly a decade of planning, the much-anticipated Aga Khan Garden is set to open at the University of Alberta Botanic Garden in Devon on Friday. Construction on the 4.8-hectare garden began at the beginning of 2017. The garden features secluded forest paths, fruit orchards and more than 25,000 trees, shrubs, perennials, annuals and wetland plants. “We’re so thrilled to finally be able to share with the public this time of transformation at the garden,” garden director Lee Foote said. 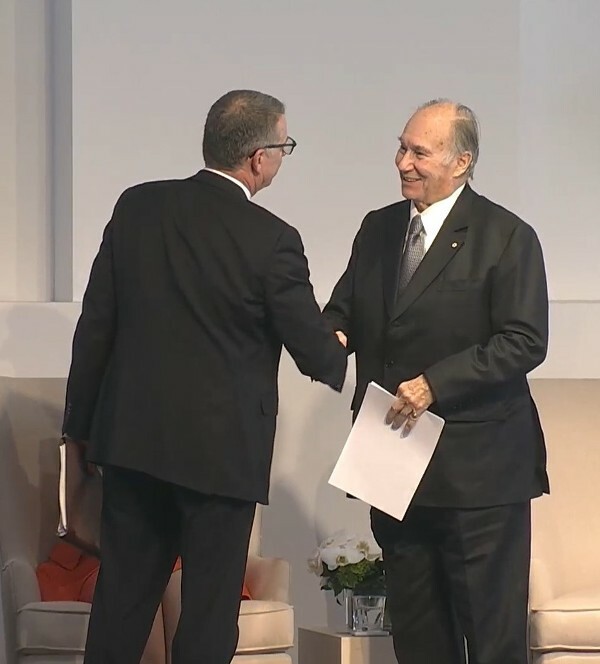 The new garden was made possible thanks to a $25-million gift from the Aga Khan, the spiritual leader of about 15 million Ismaili Muslims around the world. 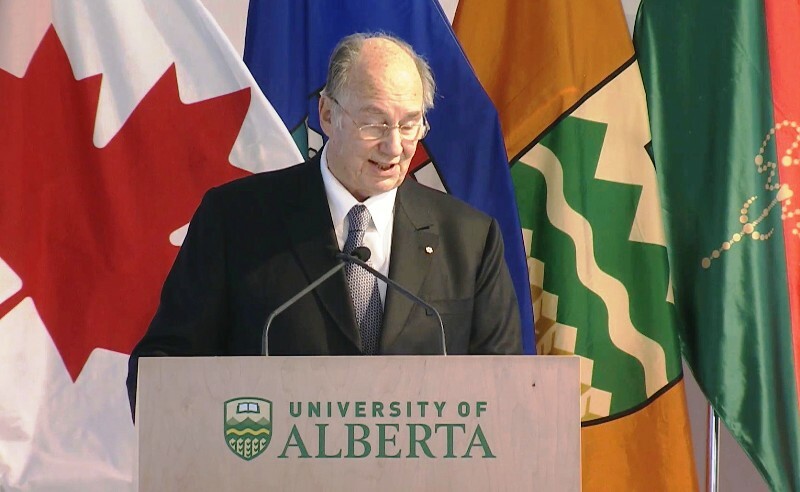 The University of Alberta bestowed an honourary doctorate to the Aga Khan in 2009. The Mughal-inspired garden was created using historic Islamic landscape architecture and will be the northernmost Islamic garden in the world. The feature is expected to more than double the number of annual visitors to the botanic garden. Parking improvements and a new entry plaza were also constructed in order to accommodate the spike in visitors. “The Aga Khan Garden has been designed and constructed to provide enjoyment for hundreds of years and many generations to come,” Foote said. Finishing touches on landscaping and planting will continue throughout the year and into 2019. The garden opens on Friday and will remain open until Oct. 8. 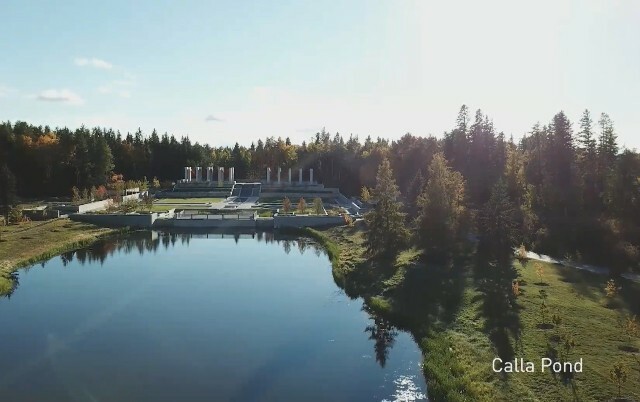 Watch below: After almost a decade of planning and months of construction, the highly anticipated Aga Khan Garden is set to open at the University of Alberta Botanic Garden in Devon on Friday. Paula Simons: 'No person leaves unchanged.' New Aga Khan Garden a gift of paradise. This is a timeless, multi-multi-multi-generational garden. Our great-great-great-grandchildren will be enjoying this garden." Beauty surrounds us, but usually we need to be walking in a garden to know it. Rumi, 13th century Persian poet. On a sunny Wednesday morning, Lee Foote, director of the University of Alberta Botanic Garden, is leading a tour of the Aga Khan Garden. We walk along a raised path, winding through the spruce and jackpine and aspen wilderness to a long black granite reflecting pool which mirrors the sky and the trees above. Once, Foote jokes, this was a bog. Now, it’s been transformed into a woodland bagh — the Persian word for garden. From this imposing throne room, we look down on a tapestry of waterfalls, fountains, reflecting pools, and a series of formal gardens, all laid out along traditional Islamic geometric, rectilinear lines. There’s also a 250-seat outdoor Greco-Roman amphitheatre. But this isn’t just an imported form imposed on the boreal forest. It’s not a kitschy faux-Muslim theme park. The garden embraces its northern Alberta topography and botany, redefining an ancient art form in a new setting. It’s a vista of soft grey limestone and granite, cascading water, green lawns and colourful blossoms. The edge of the very manicured and formal gardens blurs and blends into a natural pond. Yes, it’s an authentic Alberta slough, tidied up a bit for company. Surrounded by a young orchard of 120 fruit trees — cherry and apple and pear and plum — the pond is home to ducks and geese and coots. The native wetland contrasts sharply with imported Persian refinement. But the juxtaposition is magical. “We have an unstated mandate here, that no person leaves unchanged,” says Foote. 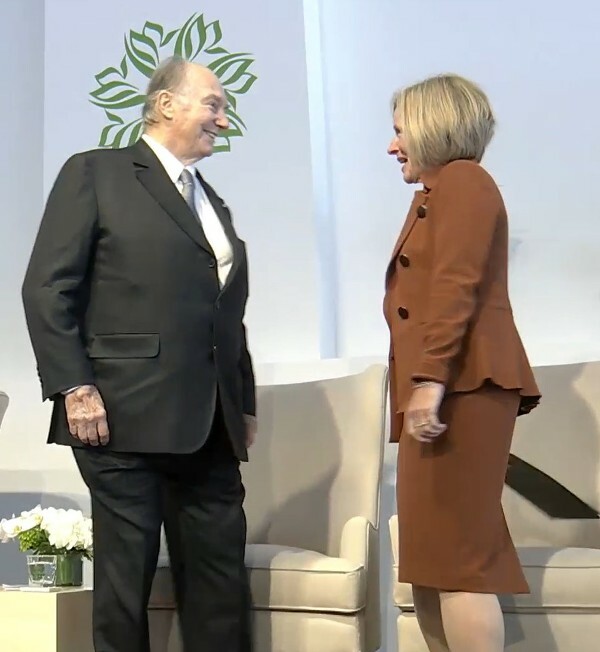 The $25-million garden was a gift to the U of A, and to Alberta, from His Royal Highness the Aga Khan, the hereditary Imam of the world’s Shia Ismaili Muslims. It’s part of a network of 11 traditional Islamic gardens the Aga Khan has built or restored around the globe. This is the most northerly Islamic garden in the world, and the largest in North America. The Aga Khan commissioned American landscape architect Thomas Woltz of Nelson Byrd Woltz to design the 4.8 hectare space, inspired by the great Mughal gardens of India and the Middle East. Such gardens, built in desert or other very hot climates, celebrated water. Here too, fountains and pools create humid microclimates, nurturing the plants around them. The perennials and annuals, the rose bushes and saplings, have just been put in place. It won’t be until late July that everything is in full bloom. And it will take years before the garden grows into its full self. Foote acknowledges the garden looks a bit austere. Once the flower beds come into their own, he says, they’ll soften the sharp edges, like curvilinear Arabic calligraphy, like traditional Persian paisley-shapes. The Aga Khan garden is just part of the site’s total makeover. Formerly the Devonian Botanic Garden, the park, located on Highway 60 between Enoch and Devon, will welcome visitors when it opens this Friday with $13 million in other renovations. There’s a new entry plaza. New parking lots. A new sewage treatment system. Wi-Fi. A new shuttle service for people with mobility issues. That’s handy. Thanks to the grace and grandeur of the Aga Khan’s gift, I suspect attendance at University of Alberta Botanic Garden is about to blossom. We can’t all be invited to the Aga Khan’s island. We can, though, visit the little piece of paradise he’s given us. What does it take to build a $25 million garden? Designed for the region’s climate and topography, spectacular one-of-a-kind garden offers a place for connection, contemplation and education. A unique and spectacular new addition to the University of Alberta Botanic Garden will be unveiled to the public this Friday as it opens for the season. The Aga Khan Garden, a new 4.8-hectare garden made possible by a $25-million gift from the spiritual leader of the Shia Ismaili community, was designed for the Edmonton region’s climate and topography. The geometrically designed garden, which is a modern interpretation of traditional Mughal architecture, features secluded forest paths, wide stepped terraces, granite and limestone walls and paving stones, 12 water features—including some that stream into wetlands—and an outdoor amphitheatre. A fruit orchard containing plum, cherry, apple and pear trees, along with one apricot tree, extends around the large Calla Pond at one extremity of the garden while more than 25,000 trees, shrubs and perennials, annuals and wetland plants from different species around the world, all selected for fragrance, beauty and the ability to survive Alberta’s harsh climate, have been planted in the garden. Edmonton, Alberta, Canada, 29 June 2018 – After nearly a decade of planning and 18 months of construction, the much-anticipated new Aga Khan Garden in Edmonton, Alberta, was opened to the public. The 4.8 hectare Mughal-inspired garden, made possible by a CAD 25-million gift from His Highness the Aga Khan, features secluded forest paths, granite and limestone terraces, still pools that reflect the prairie sky and a waterfall that tumbles over textured stone. Fruit orchards extend around the large Calla Pond, and the garden contains more than 25,000 trees, shrubs, perennials, annuals and wetland plants, selected for fragrance, beauty and the ability to survive Alberta’s harsh climate. On June 29 the University of Alberta Botanic Gardens opened with its newest addition, the Aga Khan Garden, premiering to the public. The result of almost a decade of planning and 18 months of construction, it stands as the northernmost Islamic-themed garden in the world. Professor Lee Foote, the director of the University of Alberta Botanical Gardens, has overseen the Aga Khan project since its inception. “It’s a remarkable structure that draws influence from many of the great gardens of the world such as the Taj Mahal, the Alhambra and many others,” Foote said. Inspired by Mughal architecture, the 4.8 hectares garden was made possible by a $25-million gift from his Highness the Aga Khan, the spiritual leader of the Ismali Muslim people. It features over 25,000 trees, shrubs, perennials, annuals and wetland plants all chosen for their hardiness and fragrance. Foote said that certain warm weather plants, which are usually featured in similar gardens, will instead be represented in stone bas reliefs (murals) including pomegranates, dates, oranges and fig trees. As fauna goes, the garden is host to many songbirds, 400 species of pollinators and waterfowl with a moose proof fence now surrounding the garden to keep large mammals out. The garden is constructed primarily from Canadian granite and limestone. It is specially designed to last for hundreds of years, with a textured waterfall at its centre. “There are 830 tonnes of detailed stonework done by Scorpio Masonry, it follows fairly traditional lines using a lot of precision cut stone welded together in geometric patterns that give a nod to the complex mathematics of Mesopotamia,” Foote said. The architect of the project was Nelson Byrd Woltz, an American architectural firm which traveled to sites across the world for inspiration. After designing the building it was approved by the Aga Khan, an architect enthusiast, before the 65-man construction crew began their work through summer and winter. Foote said the garden’s primary purposes are to be a place of connection, enjoyment, contemplation and education. One point Foote wanted to stress was that this garden is not a religious garden, but rather one of cultural Islam. He said it is an important distinction to make as people can come to the gardens to learn about the culture or simply enjoy the inspiring space. While the bulk of construction on the Aga Khan Garden may be completed there is still more to be added. The planned pavilion, which Foote has petitioned Parkland County to help fund, is to be a companion space adjacent to the Aga Khan Garden. It will take $5.2-million to build, of which they have a little over $2.5-million in promised or in hand according to Foote. Once the funds are in place they will break ground on the projected nine-month build. This will greatly enhance the winter programming for the garden, give events like weddings a place to be held and provide an alternative concert venue in bad weather. Everything in the garden from fountains, the amphitheatre and the flower beds are all mobility accessible by wheelchairs and strollers. “We put an emphasis on everybody-rural-urban-no racial, no creed, no religious restrictions, this is a garden for everybody,” Foote said. Foote believes the Botanic Gardens will become for Parkland County what the Telus Science Center is to Edmonton, with one being hard pressed to find a student who hasn’t visited them. 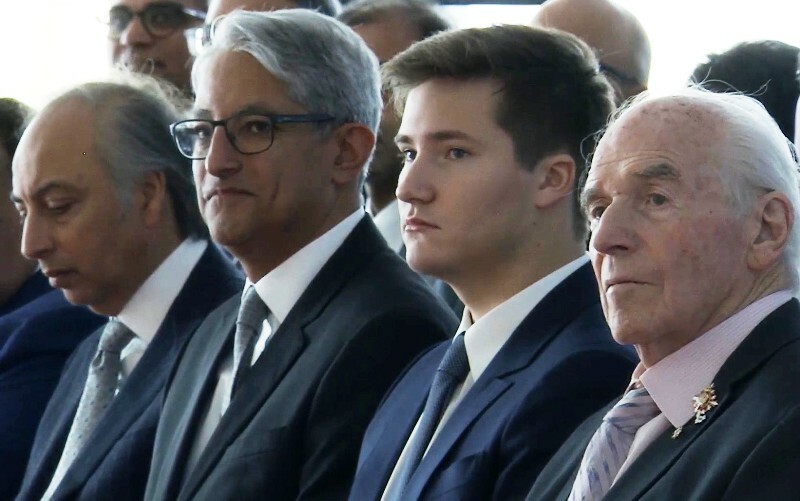 The Aga Khan will occupy the rest of Foote’s career, as he adds the final touches, develops programming and hosts international delegations. “The Botanic Garden had been a rather sleepy place for two decades, we were a gorgeous set, rural garden and it was like a mushroom building up its reserves and finally popping up and blossoming,” Foote said. Foote advises attendees to come at different times of the day and in different weather conditions. Photographers especially will find the garden has multiple unique looks as the day and weather progresses. For those interested in finding one of the many hidden nooks and alcoves the garden boasts Foote encourages people to come, enjoy the high speed internet, and work in a natural setting. “We talk about working from home a lot, so how about working from the garden?” Foote asked. Admission to the Botanic Gardens this year is $15.85 a person. We talked with Lee Foote about the construction of the Aga Khan Garden, funny stories that came from the building process, and problems the team had to overcome to create the exhibit. Watch our coverage below. 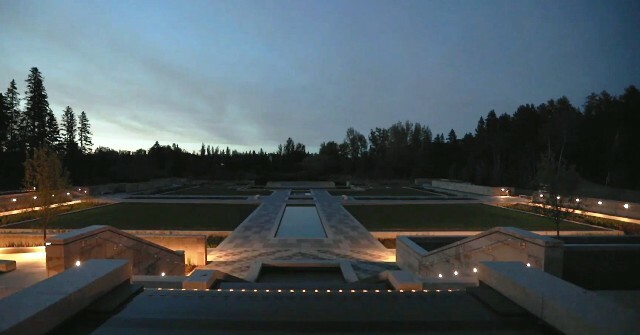 A video walk-through of the Aga Khan Garden, Alberta, featuring drone footage. 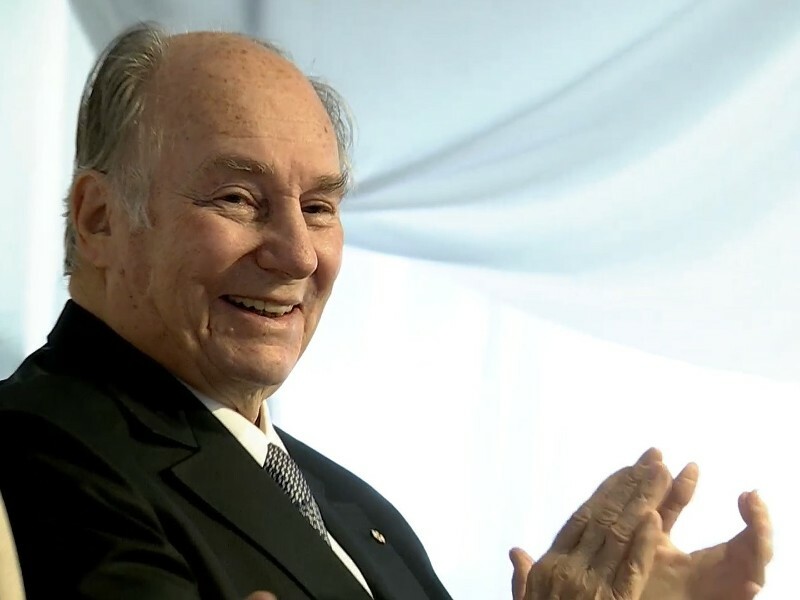 The Aga Khan is coming to the University of Alberta Botanic Garden October 16 to officially inaugurate the garden that bears his name in a private ceremony. The public will be able to view the event here. New garden built to enhance cultural understanding and peace is a major Alberta cultural asset. The Aga Khan will be at the U of A Botanic Garden Oct. 16 for a private ceremony inaugurating the breathtaking 4.8-hectare garden that bears his name. The Aga Khan is coming to the University of Alberta Botanic Garden to officially inaugurate the garden that bears his name in a private ceremony on Oct. 16. The 4.8-hectare Aga Khan Garden, given to the people of Alberta as a gift by the Aga Khan, is a contemporary interpretation of Islamic landscape architecture in a northern climate. This week is your last chance to visit the new Aga Khan Garden at the U of A Botanical Garden this year. Doors close for the last time this season at 5 p.m. on Monday, Oct. 8. It opened in late June to rave reviews, contributing to a doubling of visitors to the U of A Botanic Garden in July and August compared with the previous two years. Designed as a space to enhance dialogue and understanding among people of all backgrounds, the Aga Khan Garden is the latest in a network of 11 Islamic gardens and parks built or restored by the Aga Khan Trust for Culture around the world that offer spaces for connection, contemplation and education, enabling cultural understanding to flourish. The garden—designed by world-renowned landscape architecture firm Nelson Byrd Woltz—also has the distinction of being the northernmost Islamic garden in the world and only the second one in North America. “While it’s inspired by other spectacular Islamic gardens around the globe, the Aga Khan Garden is truly unique,” said Lee Foote, director of the U of A Botanic Garden. The Aga Khan is the spiritual leader of Shia Ismaili Muslims around the world. One of the world’s leading advocates of a pluralist, cosmopolitan ethic for more than 60 years, he embraces human diversity as a fundamental value and as an antidote to social fragmentation and division. He received an honorary degree from the U of A in 2009 in recognition of his lifelong service to humanity. Although the official inauguration is a private event, the public can view it via livestream. The University of Alberta is hoping to raise $4 million in order to build a new pavilion at the Aga Khan Garden. On September 27, plans for the Aga Khan Garden Pavilion were outlined in a presentation at the General Faculties Council Facilities Development Committee. The pavilion will be a two-floor, 600 square metre, multipurpose gathering space that will support the University of Alberta Botanic Garden’s (UABG) activities. A completion date for the pavilion has not been set. 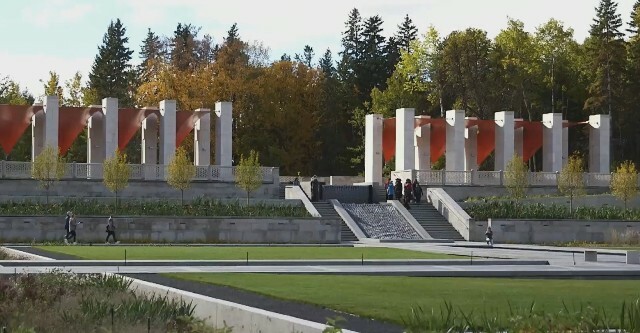 The Aga Khan Garden opened in June and is the first Islamic garden to open in Western Canada. The $25-million garden was donated by the Aga Khan, who leads the second-largest Shia branch of Islam. While the pavilion was always intended to be part of the garden complex, it has not been built yet since it was not apart of the original donation. The pavilion will have a small kitchen, bathrooms, an upper viewing terrace, as well as event security in case of bad weather. It will be open to any patrons visiting the garden when no events are happening. Any revenues generated by the pavilion will go back to supporting UABG programming and operations. Kelly Hopkin, manager of campus architecture, said he is excited to see the next part of the garden come to life. Including construction, the pavilion will cost around $4 million. The entire project will be financed through donations. Hopkin said the pavilion is designed to be multi-faceted, allowing it to hold multiple events at the same time. He added that when a private function is happening, the pavilion is separated enough from the garden that it will not disrupt visitors. Hopkin added that extensive research by the faculty of agricultural, life, and environmental science and architects was taken to ensure that the new structure will fit with the overall setting of the garden while incorporating architectural elements common to other historical Islamic gardens. “While only a small space, [the pavilion] completes what the garden is trying to do,” Hopkin said. In addition to bringing to life some of the oft-forgotten and striking cultural richness of Muslim societies of the past, the Aga Khan Garden was also conceived as a catalyst for scientific inquiry. The garden, administered through the faculty of agriculture, life and environmental sciences at the University of Alberta, extends the faculty’s research programs across many fields including the environmental sciences, agriculture, and ecology at the site with results destined for international distribution. The garden also links the Edmonton region to a network of idyllic sculpted landscapes around the globe. The Aga Khan Garden, Alberta joins a series of world-renowned gardens across the globe such as Sunder Nursery in Delhi, Bagh-e Babur gardens in Kabul, and Khorog City Park in Khorog, Tajikistan, all of which are sites of global repute in the world of cultural restoration, landscape design and architecture. From adult learning to well-being and early childhood education, the programs at the Aga Khan Garden will reflect the university’s mission and aspiration — to make a difference in society for the benefit of our communities, country, and the world. Stanford Blade is the dean of the faculty of agricultural, life and environmental Sciences (ALES) at the University of Alberta. ALES teaches 1,600 undergrads, 500-plus graduate students and works closely with the agriculture, food, forestry and environmental sectors in conducting high-impact research and innovation. The gift of the Aga Khan Garden symbolizes the hope, peace and unity that can come when people interact with each other amidst the beauty and inspiration of nature. The garden reflects the Aga Khan’s belief in pluralism, openness and inclusion. The design for the Aga Khan Garden includes a Diwan (pavilion) — a warm and welcoming gathering place for people of all ages and backgrounds. Your support is needed to build the Diwan. 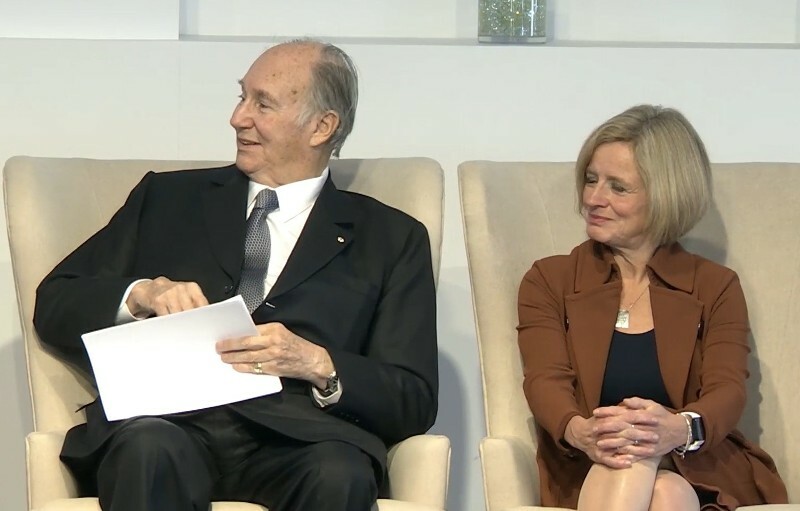 A decade ago, plans for construction of the world’s northernmost Islamic garden located southwest of Edmonton seemed an unlikely dream, the Aga Khan told a crowd that gathered Tuesday to celebrate the opening of a $25-million garden he gifted to the University of Alberta. The Aga Khan Garden, named for the 49th hereditary Imam of the world’s Shia Ismaili Muslims, sprawls over 4.8 hectares — about the size of 31 NHL hockey rinks, and is set amidst the larger University of Alberta Botanic Garden, located about 15 minutes southwest of the city. “Down through many centuries, Islamic culture has continued to see the garden as a very special place, where the human meets further proof of the divine,” the Aga Khan said, speaking at a private inauguration ceremony for the garden Tuesday. Although the Aga Khan is a religious leader, his mandate includes embracing pluralism and improving the wider community. He received an honorary degree from the University of Alberta in 2009 for his lifelong contribution to humanity, the U of A said. 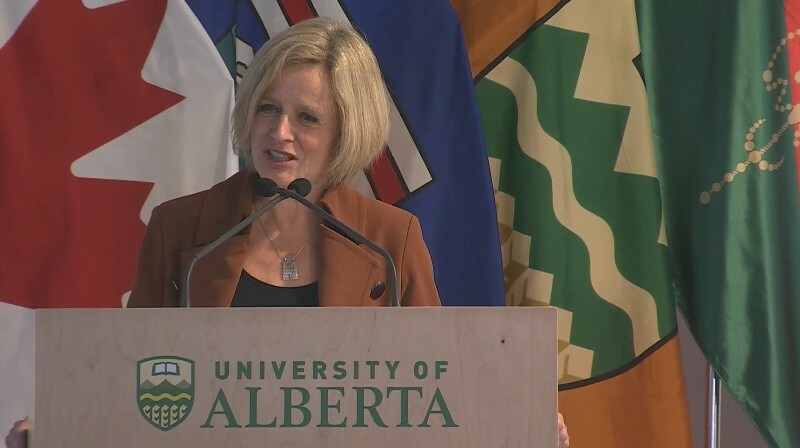 During the ceremony, Premier Rachel Notley, Lt.-Gov. Lois E. Mitchell and University of Alberta president David Turpin also spoke during the ceremony, thanking the Aga Khan for his gift. Although planning spanned years, the garden took 18 months to build. The design is composed of three sections: a woodland ‘bagh’ (from the Persian word for garden); a large geometric formal garden featuring stone architecture, walkways and water features; and a bustan — a natural area surrounding a pond that’s bordered by fruit trees. In addition to the garden’s elements, an amphitheatre was built into an existing woodland bowl. The garden’s designer, landscape architects Nelson Byrd Woltz, said the goal was not only to showcase the beauty of Islamic history, but to promote a sense of unity through the geometry that flows through the design. “The message of this garden is one, I believe, of pluralism,” principal architect Thomas Woltz said. The ceremony was held inside a tent that will become the site of a pavilion called the Diwan, which will be funded by donors, Turpin said. When completed, the pavilion will be able to host events such as education groups or weddings. The garden, which is the most northerly in a network of 11 traditional Islamic gardens the Aga Khan has built or restored around the globe, opened to visitors in July and a public celebration will be held in 2019. Posted: Tue Oct 16, 2018 6:16 pm Post subject: 2018, October 16: Imauguration of the Aga Khan Garden. 2018, October 16: Inauguration of the Aga Khan Garden in the presence of Mowlana Hazar Imam and Prince Aly Muhammad. 2018, October 16: Inauguration of the Aga Khan Garden (Edmonton, Canada) in the presence of Mowlana Hazar Imam and Prince Aly Muhammad. 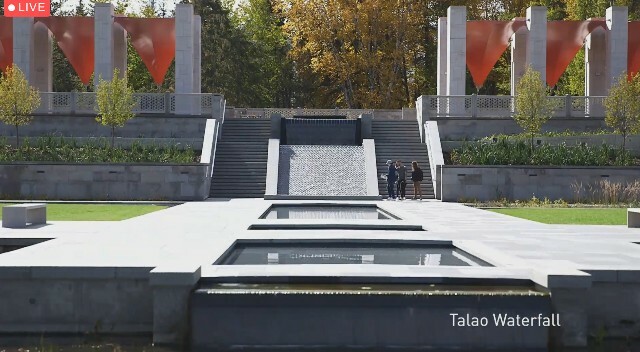 2018-10-16 Edmonton, Canada : Here is a 5 minutes highlights video of the inauguration ceremony of the Aga Khan Garden. How can we foster global citizens? This is an important question and one a university often considers. While both teaching and learning are at the heart of what post-secondary institutions are about, we also have a responsibility to take education beyond preparing graduates to succeed in their chosen fields. The education of today is as much about teaching others as it is about teaching ourselves — with the intent to understand our roles in society and learn how we can nurture a sense of community service from within, whether in our own backyard or on the other side of the world. On Wednesday, the University of Calgary will confer an honorary degree on His Highness the Aga Khan. As someone who has dedicated his life to the betterment of others, and to ensuring that everyone has the opportunity — and the right — to a healthier, improved life, His Highness has led by example by showing us all how service to our communities impacts those around us, as well as those who we may never know. It’s not often a post-secondary institution is provided with an opportunity to celebrate its connection and shared commitment to community service with an individual who exemplifies what it means to integrate pluralism and a sense of commitment into our lives. The ceremony will be attended by members of the university community, the Ismaili Muslim community and the community at large. This is especially fitting, as His Highness the Aga Khan has dedicated his life to promoting the concept of a pluralistic society, in which understanding, support and acceptance are valued ingredients. The University of Calgary will also sign a Memorandum of Understanding (MOU) with the Aga Khan University (AKU), a step forward in the long-standing and deep connections our institution has shared with the incredible network developed by His Highness. Over the past 20 years, the university has been fortunate to send students and faculty to locations around the world to conduct research, share knowledge and learn from others at AKU campuses and in the field. We’ve partnered in health care, education, international development and more. In turn, we’ve welcomed many people to Calgary to do the same. Working with AKU, the Aga Khan Foundation Canada and other key agencies of the Aga Khan Development Network, we’ve developed projects and programs that foster a better understanding of the challenges faced by others on a daily basis, and we’ve learned how we can focus our internationalization efforts on issues where we can make a difference. These relationships go through our doors and into the communities around us, with the goal of fostering and enhancing engagement at the community and societal levels. Through our strong connections with the local Ismaili community, we’ve developed courses and hosted workshops, engaging local youth in discussions on the future of employment, and teaching others about Muslim civilizations. We’ve partnered with the regional Ismaili community to offer opportunities for our students and staff to learn from guests from the Muslim community in the fields of academia, civic society, and government. Giving back to the community — in whatever ways are possible — is at the heart of what makes Calgary the remarkable city that it is, in good times and bad. 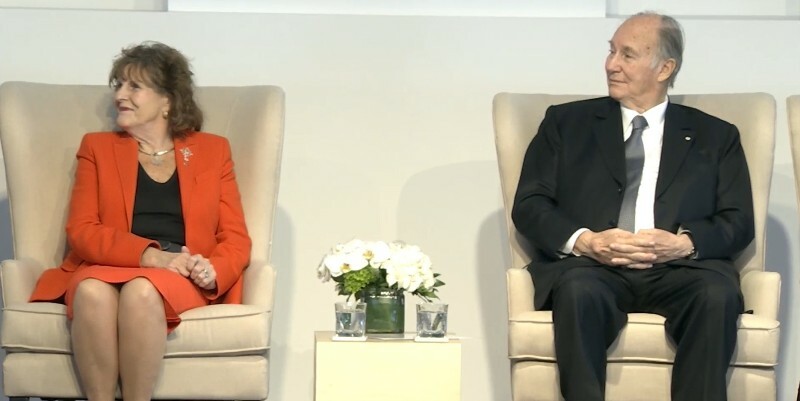 We welcome the opportunity, through the example set by His Highness’s initiatives around the world, to learn more about the importance of volunteerism and providing support for those who need it most. Ultimately, it’s about respect and shared values — respect for others, and an openness to understanding how we can all become better world citizens. In times of global uncertainty, such as what we face today, these are important lessons to learn. 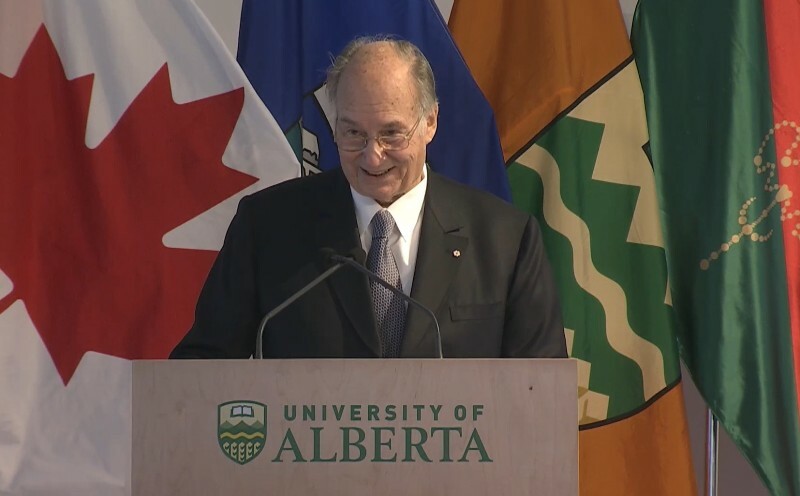 The University of Calgary is pleased to confer an Honorary Doctorate of Laws (HD) on His Highness the Aga Khan, to recognize his service to the support of social and human development everywhere around the globe. His leadership serves as a shining example for us as we seek opportunities to make a difference, both at home and around the world. Deborah Yedlin is Chancellor of the University of Calgary. EDMONTON—With a geometric shape that is Islamic in design but Albertan in ecological makeup, the Aga Khan opened his namesake garden in Edmonton with much fanfare Tuesday. The 4.8-hectare garden at the University of Alberta Botanic Garden, 15 minutes southwest of Edmonton, is being billed as the northernmost Islamic garden in the world. Although it opened to visitors on June 29, the space was officially inaugurated by the Aga Khan, the 49th hereditary imam (spiritual leader) of the world’s Shia Ismaili Muslim community. “This is a highly valued gift for generations to come who also must be privileged by experiencing the spirituality and harmony of multiple life forms,” he told guests at the event. 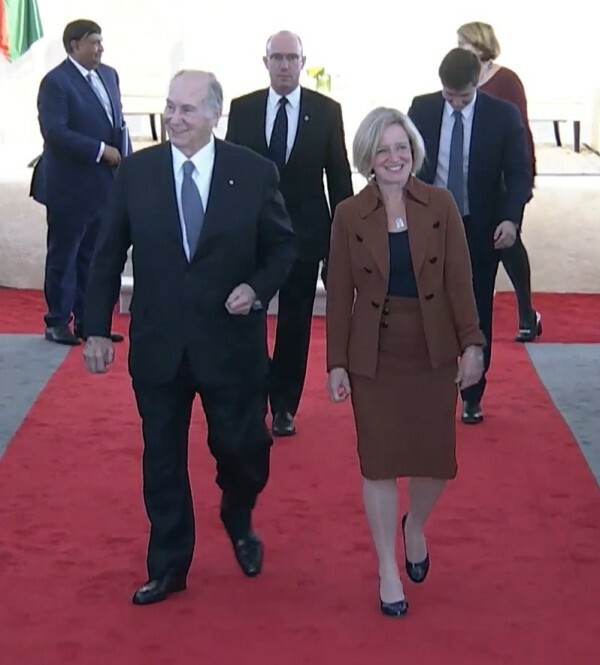 The Aga Khan’s presence at the Islamic garden was met with much delight, especially from members of Edmonton’s 6,000-strong Ismaili community. 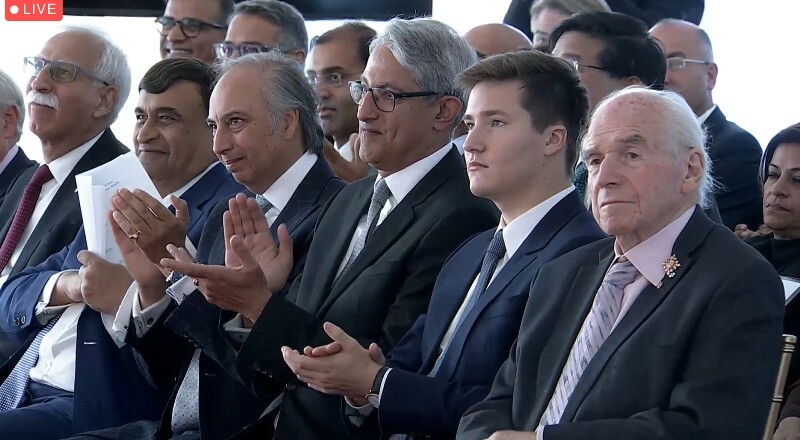 “I think today is a very special day because it symbolizes the real and long-standing alignment of values between Canada, Alberta and the Ismaili Imamat,” said Rahim Talib of the Ismaili Council of Edmonton. The showpiece space has a secluded woodland pathway that leads to the formal garden. It was inspired by the Mughals (an empire in the Indian subcontinent during the 1500s known for building beautiful gardens and architecture, including the Taj Mahal), with a granite and limestone terrace, or talar, with intricate geometric designs etched in the stone. The talar overlooks the garden, which is separated into four quadrants, with rectangular pools of water in the middle and colourful shrubs and flowers across. The pools get filled from a granite waterfall that flows all the way up to the mahtabi, a floating platform which architects say was a common element in all Islamic gardens they researched around the world. The mahtabi opens to the bustan, which is a meadow with a pond that symbolizes a traditional hunting ground during the Mughal era. The $25-million garden took eight years to plan and 18 months to build. 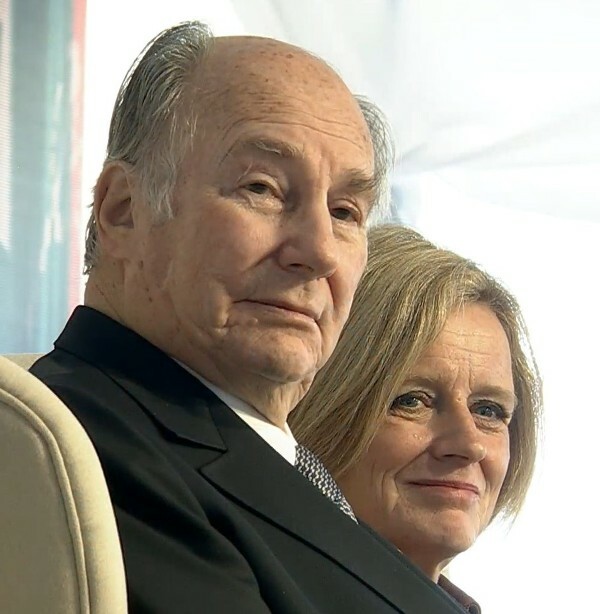 It was first announced by the Aga Khan in 2009 while receiving an honorary degree from the University of Alberta for his lifelong contributions to humanity. Talib says, as an Ismaili, the design of the garden is very significant. “For me, personally the Aga Khan Gardens symbolize education. His highness is always emphasizing the importance of knowledge and learning, in order to learn about God’s creation,” he said. Thomas Woltz of the Nelson Byrd Woltz architectural firm, which designed the garden, said education is definitely a part of the garden, especially for young children. “We are hoping to engage children with a learning dock, where they can get down and have close access to the water’s surface to measure water quality, count plants, capture amphibians and release them, and have a really close contact with nature,” Woltz said. The garden includes 25,000 perennials, wetland plants, shrubs and trees and 12 water features. It is part of a network of 11 gardens around the world — from Cairo, Zanzibar, London to Delhi — rebuilt or restored by the Aga Khan. At the inauguration, Aga Khan announced creating another garden in Burnaby, B.C., to become the westernmost Islamic garden. For Talib, his favourite part of the garden is the talar. 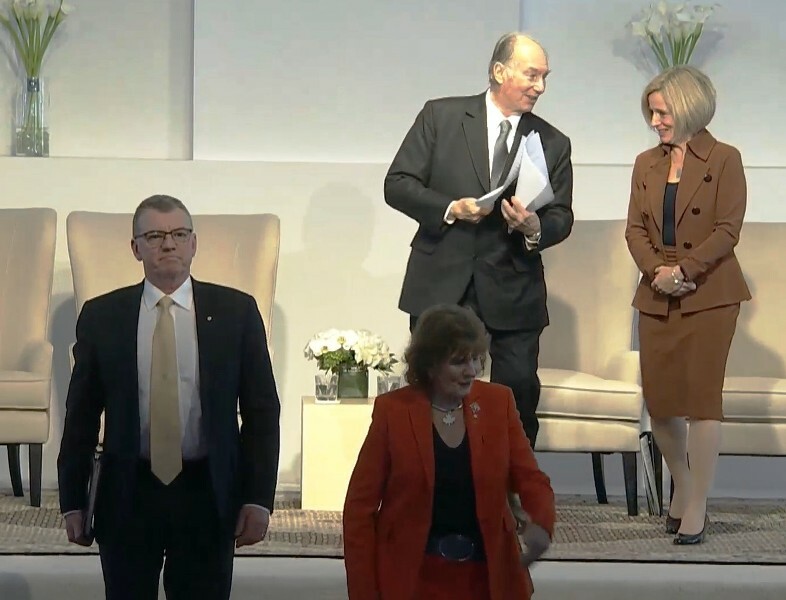 Mawlana Hazar Imam joined Lieutenant Governor of Alberta Lois Mitchell, Premier of Alberta Rachel Notley, and University of Alberta President David Turpin on 16 October for the inauguration of the Aga Khan Garden, Alberta. The 4.8-hectare Aga Khan Garden, Alberta, located 15 minutes southwest of Edmonton, is the northernmost Islamic garden in the world. Inspired by Mughal-style landscape architecture, it features limestone terraces, geometric water features, an outdoor amphitheater, and an orchard of local plants selected for fragrance, beauty, and ability to thrive in Alberta’s climate. Construction on the Garden, which was recently completed, took place during both the 150th anniversary of Canadian confederation and Mawlana Hazar Imam’s Diamond Jubilee. The synchronicity was fitting, given the strong consonance of values between the Imamat and Canada. 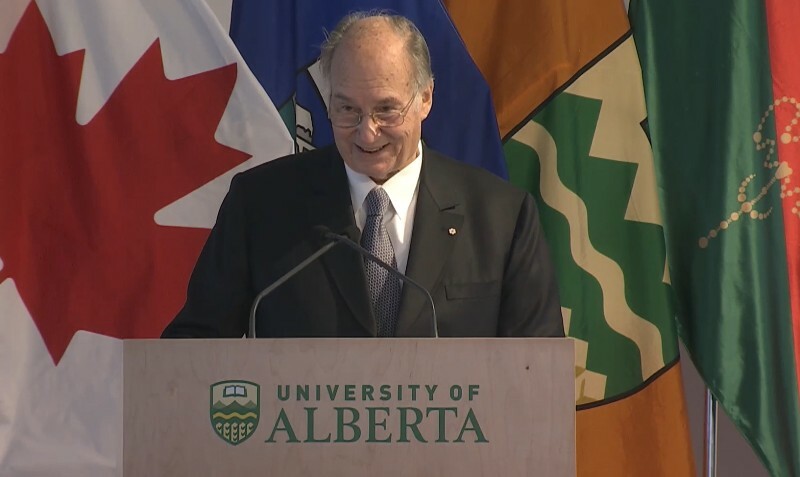 During his remarks at the inauguration ceremony, Mawlana Hazar Imam reflected on the evolution of the Garden, recalling earlier visits to the University during his Golden Jubilee year — in 2008, and again in 2009 — when he received an honorary degree from the University of Alberta and expressed his desire to create an Islamic garden in Edmonton. The Aga Khan Garden deepens and honours an existing partnership between the University and the Imamat. The project’s development has been led by the Aga Khan Trust for Culture (AKTC) in collaboration with the University of Alberta and the Aga Khan University. In his speech, Mawlana Hazar Imam highlighted the role gardens play in our understanding of the natural environment. “Gardens in this context can be seen not as imitations of Nature but as humanity’s interpretations of nature, their geometric structures providing a human framework in which we can experience — in this case — the magnificent fluctuations of the Albertan landscape,” he said. The creation of parks and gardens has been an important part of the work of the AKTC, bringing people of different backgrounds together to enjoy and appreciate nature, and seeking to improve quality of life by providing spaces for reflection, spirituality, education, and leisure. 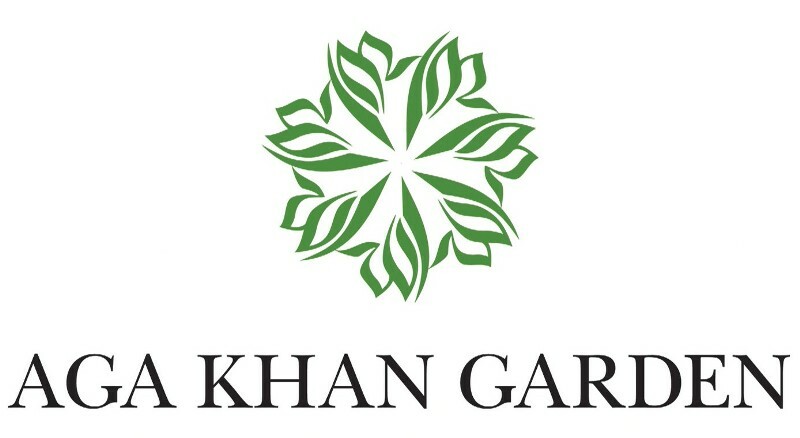 The Aga Khan Garden is Mawlana Hazar Imam’s second landscape project in North America along with the Aga Khan Park in Toronto, and the 11th in a series of parks and gardens developed by the AKTC. The addition of the Aga Khan Garden to the University of Alberta Botanic Garden is expected to more than double the number of annual visitors from 75,000 to 160,000. With 25,000 plants, 120 fruit trees, 12 water features and more than 650 tonnes of granite and polished limestone, it is far from your typical garden. Then again, that was the point – to make it something distinctive, a place for contemplation. 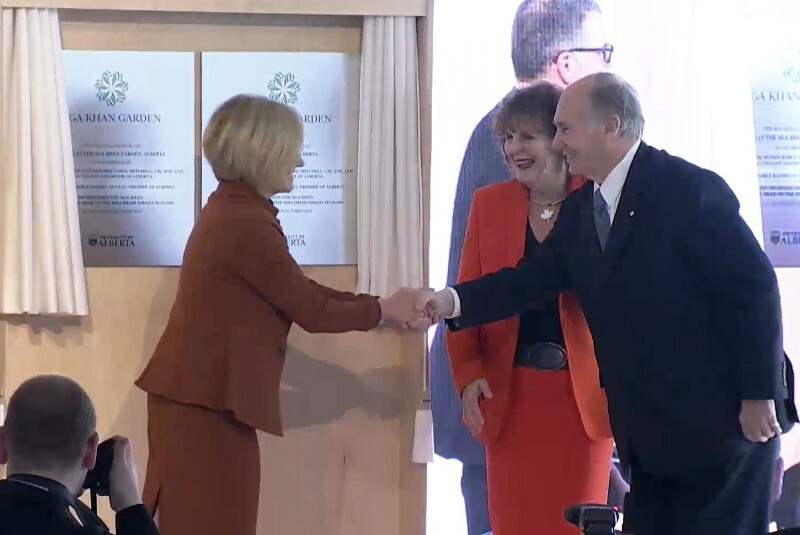 The Aga Khan Garden, part of the University of Alberta Botanic Garden, was formally opened Tuesday afternoon with the 81-year-old spiritual leader of the Shia Ismaili Muslims overseeing the completion of his $25-million gift to the university. The garden is a 4.8-hectare expanse located southwest of Edmonton and is designed to highlight the architecture and feel of an Islamic garden. Of the many projects the Aga Khan Development Network has undertaken to promote peace and well-being, the Aga Khan Garden is the most northerly based, a tribute to the U of A’s continuing relationship with the Aga Khan. 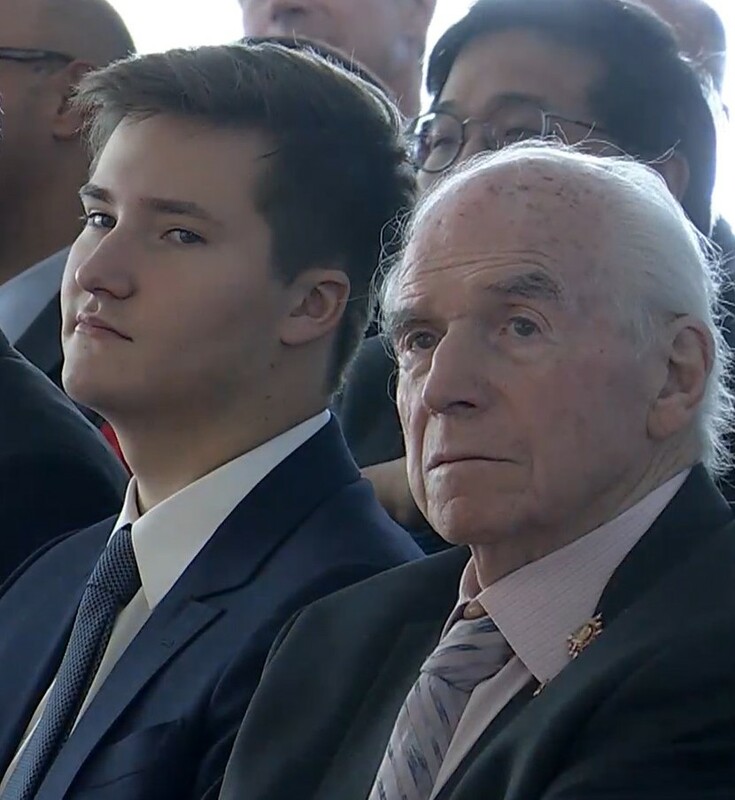 His appearance for Tuesday’s official introduction drew a supporting cast that included Alberta Lieutenant-Governor Lois Mitchell, Premier Rachel Notley and U of A president David Turpin. “[This] seemed an unlikely dream to many,” the Aga Khan said. “The symbol of the garden as a spiritual symbol goes back to the holy Koran itself." He also spoke of his friendships and affection for Canada. In 2009, he was dubbed “a beacon of humanitarianism” and made an honorary Canadian citizen by then-prime minister Stephen Harper. He was awarded the first Adrienne Clarkson Prize for Global Citizenship in 2016. He previously approved the construction of the Aga Khan Museum and Park in Toronto. The man who helped deliver on the AKG assignment is Lee Foote, the U of A Botanic Garden director and transplanted Louisiana native who has spent the past 22 years in Edmonton. Mr. Foote and the Aga Khan hiked up a Botanic Garden deer trail in 2012 and were captivated by the view. The Aga Khan asked if his garden could be switched from its original location to this one. Without consulting the university, Mr. Foote agreed. The AKG opened to the public in late June and was greeted with rave reviews for its Woodland Bagh reflecting pool, stonework, outdoor amphitheatre, fountains and sunken floral beds. The garden’s motto is: No one leaves unchanged. It’s a sentiment not lost on its director. While visiting Western Canada, the Aga Khan is set to receive honorary degrees from the University of Calgary, University of British Columbia and Simon Fraser University. Please note that the Aga Khan Garden is now closed for the season and will reopen May 1, 2019. 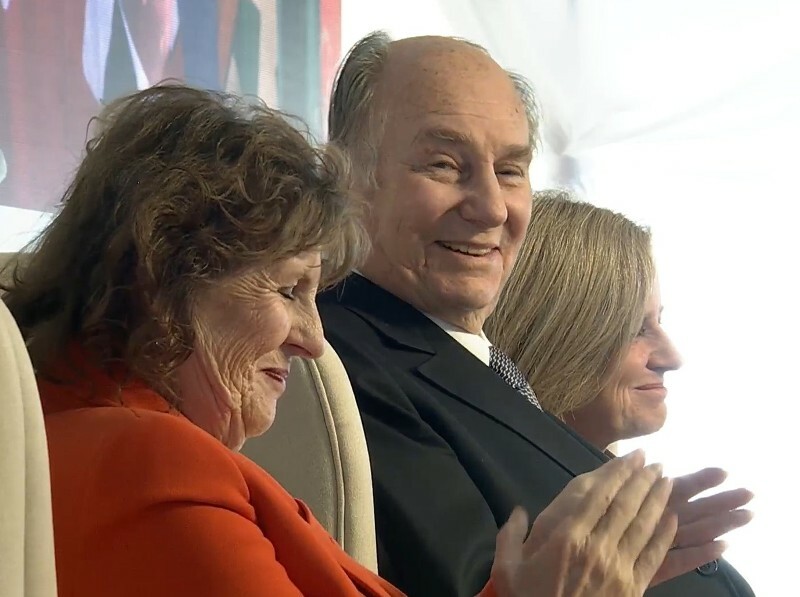 On Oct. 16, 2018, His Highness the Aga Khan, spiritual leader of 15 million Ismaili Muslims around the world, visited Alberta for the official inauguration of the extraordinary new Aga Khan Garden, Alberta. The garden, located 15 minutes southwest of Edmonton in Parkland County, is a gift to the University of Alberta and all Canadians from His Highness. It welcomed its first visitors in summer 2018. Visit caps first season for cultural and architectural masterpiece, the world’s northernmost Islamic garden.